Bugatti has revealed a new version of the venerable Chiron at the 2018 Geneva Motor Show, which comes with improved performance because the original was a bit of a slouch it seems. Anyway, this is the Chiron Sport, and it comes with an eye-watering base price of 2.65 million euros (RM12,851,970). That’s a lot of money, but then again, the Chiron Sport is being touted as a car with a lot more to offer than a standard Chiron. If you’re expecting more power from the 8.0 litre quad-turbo W16 engine, sorry. There’s still “only” 1,479 hp (1,500 PS) and 1,600 Nm of torque available, so you won’t get from 0 to 100 km/h any faster than before, nor will you have a higher top speed. So, what do you get then? Well, with the Chiron Sport, Bugatti has focused on making it more of a track monster with a new handling pack. With it comes 10% stiffer suspension, an optimised rear-axle differential and a new Dynamic Torque Vectoring function that distributes torque individually to the wheels on each side. The car is also a whopping 18 kg lighter than a regular Chiron too, with many components now being made of carbon-fibre. These include the stabiliser, intercooler cover and yes, even the freaking windscreen wipers. Elsewhere, the Chiron Sport also features lighter glass in the rear window and a new, lighter exhaust deflector. If you’re worried the plebs might mistaken your Chiron Sport for a run-of-the-mill Chiron, don’t worry. 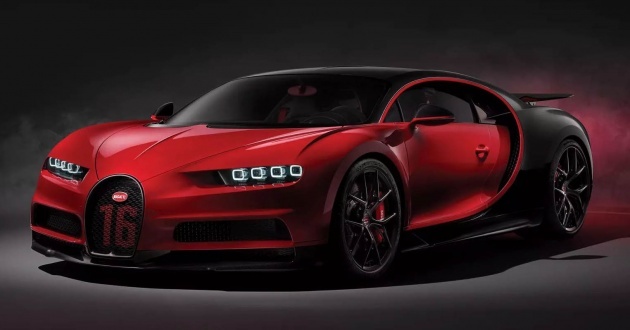 Bugatti has fitted the new version with a four-pipe exhaust instead of the angular two-pipe setup, plus the lightweight wheels are of a different design as well.